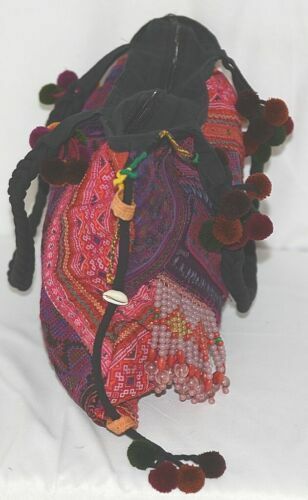 The purse has black braided handles with 2 pom poms of each color: brown, maroon, dark green and dark orange (8 pom poms total). The handles have pom poms on both sides at the bottom. 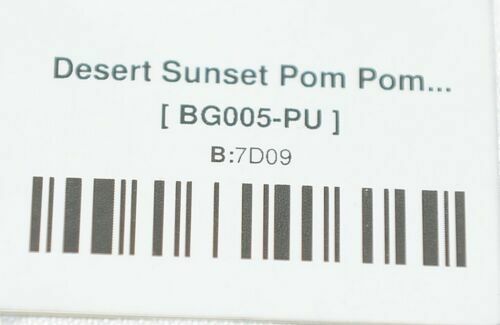 The pom poms measures approximately 1 inch wide each. 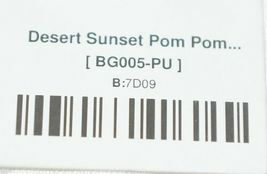 There are 4 pom poms at the bottom of the purse on each side. The front of the purse also features a dark purple needle point floral and geometric design with highlights of orange and green. It also has a pink, purple, and orange diamond geometric pattern bordered with a pink and grey shell-like shape over an orange and pink design. At the bottom of the purse is the same pink, purple, and orange diamond geometric pattern, and a purple, black and dark red swirled embroidered pattern. The left corner is another purple and salmon colored geometric diamond pattern. 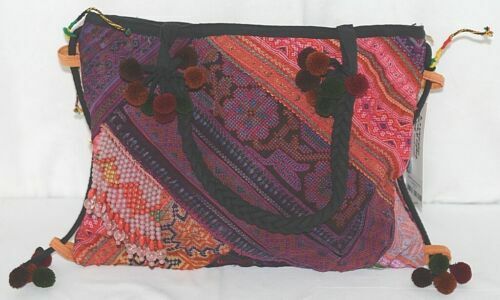 The back of the purse features the same dark purple needlepoint floral and geometric design as the front, as well as the same pink, purple and orange geometric design with the pink and grey shell like shape border. 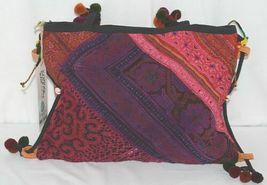 The top right side of the purse is a red and pink color, and below that is a pinkand dark pink needlepoint with a black and purple filigree-like design.